Self-improvement.com is your well-being portal. It is completely free to you and will bring you articles on self improvement, confidence, self-help, self-esteem, life coaching, and improving your spirit. We aim to update it often and grow along with you on the subjects that matter to you. Take a break from the ordinary and turn your life around. Think of us as a "spa for your mind". 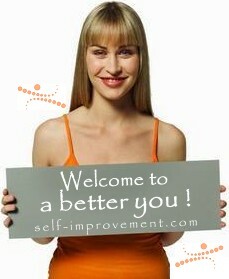 Let self-improvement.com put you on the path to greatness and be your gateway to a better you. Self-improvement can be many different things to different people. Often when we think of self improvement we think of improving "confidence" or tools for dealing with a phobia, or help to stop smoking for example. But one of the most common measures of one's mental capacity is something people refer to as "creativity." In fact, the word creativity seems to contain within its very marrow a certain element of cool, of usefulness, of cleverness that is much more enticing than say mere intelligence. As a result, socially speaking, it has become more flattering to be called "creative." And it should come as no surprise that one of the most common laments among those of average intelligence has become in recent decades, "I wish I were more creative" and seldom the more pedantic, "I wish I were smarter." But is it just the "hip factor" of creativity that woos us? Is it really just the coolness that creativity affords people like Martha Stewart or Nate Berkus or Bono that makes us suddenly dissatisfied with our own capacities to create? Perhaps, but the value of true creativity is so much more. In a very real sense, creativity is vital to one's ability to function. Where intelligence might afford us grasp of facts or a greater sense of logic, it is creativity that enables us to apply that logic in novel ways to build new points of view, new solutions, and new facts that will become part of one's lexicon. On a more personal level, creativity is what gives us opportunity when opportunity seems scarce. And I'm not necessarily talking about the way you can get your drapes to better accent the height of your ceiling or how to render your flower arrangement to elicit more wows from your in-laws. I'm talking about making life easier, more interesting, more fun, and less stressful. Why less stressful? Because creativity makes life more manageable. Imagine having the innate ability to run into blockages in relationships, finances, and business dealings, and walking away knowing that within your grasp is a truly marvelous solution. This is power. Real power. And it affords you a certain� well� coolness. Travel Apparel | Self-Improvement | Horoscope Content | Greetings | Lyrics | CupidMail | Message | item | is it a holiday ?